The hauntings of the Stanley Hotel, which is located in Estes Park, Colorado, has been the subject of interest for many years. Particularly since the famous writer, Stephen King, stayed at the Rocky Mountain resort with his wife for one night and developed the story which he made famous in “The Shining”. This structure was originally constructed by a man by the name of F.O Stanley. This individual was informed by his medical doctor in the year of 1903 that he had tuberculosis. It was advised that if he sought the comfort of the air of the mountains, his six month life expectancy could be increased. Once he and his wife witnessed an improvement in his health, they constructed a home in the beautiful mountains. 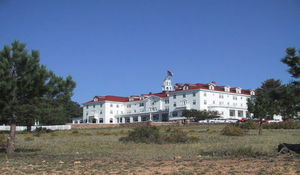 Just three short years later, he purchased the land on which the hotel now stands and crews began building the Stanley Hotel. Crews worked long hours daily in order to construct this magnificent hotel in the Rocky Mountains. In the year of 1909, F.O Stanley was able to stand in awe of the completed vision that he had for the land that he had purchased. Instantly, word traveled around the nation speaking of the delightfully large and isolated structure that was now open for business. Celebrities and those who experienced a high degree of financial wealth quickly began flocking to the area in order to reserve their stay in one of the most popular hotels of the time. Famous names such as President Theodore Roosevelt, Jim Carey, as well as royalty from Japan have experienced what it is like to stay at least one night in the Stanley Hotel. Throughout the years, there have been many discussions revolving around the spirits of the Stanley Hotel. Individuals who have worked at the hotel, or as part of the hotel, as well as those who have stayed at the resort have claimed to witness and/or experience activity that seems to be most associated with the paranormal. It appears that the spirits that seem to linger in and around the facility have no true, malicious intent. It appears as if the spirits simply enjoy the location, or that they are simply attached to the location for one reason or another. While they are startling to the people who experience them, guests can rest assured that they will not be harmed by the spirits of the Stanley Hotel. Two spirits that are said to reside within the hotel is none other than F.O Stanley himself, as well as his lovely wife, Flora. It is not uncommon for guests and employees to reflect the experience of seeing the happy couple moving along through the corridors together, or to witness them in a room in the structure engaging in activities that they enjoyed while alive. For example, F.O enjoyed playing Billiards and socializing in the bar area of the hotel. Many have claimed to have seen his spirit in these two locations. F.O loved to stand in the lobby area and greet the guests to his Rocky Mountain resort. Today, many have witnessed his apparition in the lobby, attempting to welcome the living that elects to visit him and his prized structure. Flora, on the other hand, seems to have her own agenda. In life, she thoroughly enjoyed playing the piano that is still available at the building. She would spend hours playing melodies that were delightful to the ears of the guests, or doing performances in the immense ballroom. Today, it appears as if she still loves creating sounds that the guests will enjoy. Many have witnessed the keys of her famous piano moving, with no assistance from anyone or anything else. The faint sounds of delightful music can often be heard throughout the Stanley Hotel, yet there is no explanation. Many have even claimed that they have actually seen the spirit of Flora Stanley sitting at her piano! Even in death, Flora does not seem to have lost her knack for entertaining guests. On the fourth floor of the Stanley Hotel, there seems to be a wealth of paranormal activity that occurs on a regular basis. Guests and employees alike who have been on this floor to stay or to perform housekeeping and maintenance duties have claimed that they often hear the sounds of children playing. The sounds are not faint sounds, they sound as if they are actually playing in the halls – running, laughing, talking, and even playing ball – but upon inspection, no children are present. Many have even experienced an encounter of a child spirit on the fourth floor. One of the most famous of these incidents is when Stephen King stayed in a room on another floor, in room 217. It is said that he witnessed a small boy who appeared to be in distress, and calling out for his “Nanny”. In addition to seeing the spirit of a male child, Stephen King and his wife had another interesting experience in room 217. They checked into the hotel, placed their belongings in their room, and then stepped out to enjoy dinner. When they returned, they discovered that their clothing had been placed neatly in the dresser drawers and hung in the closet. No employee of the hotel had engaged in this activity. However, there is a story of a maid that worked for the Stanley Hotel that had an emotional attachment to room 217. She is even sometimes seen walking in the room, and then disappearing into thin air – in front of guests and employees alike. In the year of 1917, a gas leaked occurred at the Stanley Hotel. The maid at the time had no idea that this leak was occurring. She was making her rounds on the second floor, lighting the lamps that used oil at the time. As she lit the lamp in the room marked 217, an extravagant explosion occurred and the entire room was damaged. A hole developed in the floor of the room, and the maid fell. The lady who experienced this was Elizabeth Wilson. Mr. Stanley did all that he could to make the incident up to her. He covered her medical expenses, gave her a well-deserved promotion, offered her additional pay, and allowed her to stay in the hotel rent free. She continued to work for the hotel for forty more years after the incident, however, it is believed that her spirit continues to work in the hotel, putting the clothes of guests away, cleaning, and making herself known to those who stay and work within the structure. There are many different hauntings that are said to occur at the Rocky Mountain resort referred to as the “Stanley Hotel”. Many notable individuals have stayed at the hotel and have several experiences to share with others who may be interested in visiting the structure. Now, if you are seeking out haunted places to go – particularly in Colorado, the Stanley Hotel is the place to be! Check for the lowest price, get directions, view photos, and read the reviews and traveler tips for the Stanley Hotel.